28 Crichton was once home to the New Edinburgh Laundry. Image: Google Maps, May 2016. This weekend Kathleen and I went out to take in the sights and the deals at the New Edinburgh Garage sale. It was an interesting walk for my own part. 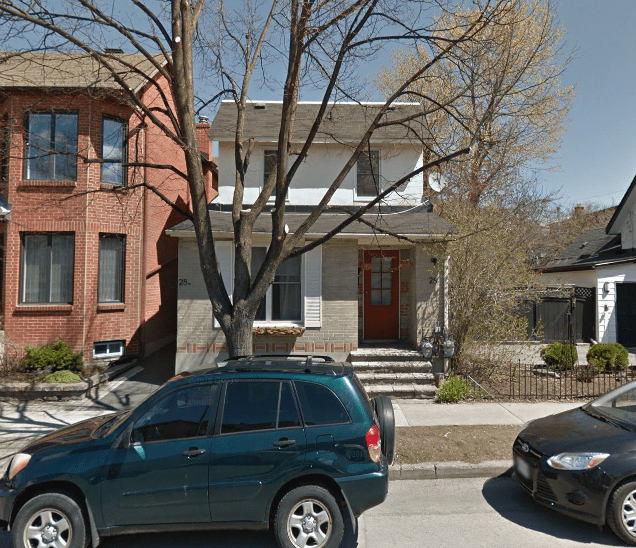 About four years ago, I moved back to Centretown from Vanier North and have not spent so much time wandering around the area, so this was a bit like visiting an old friend. As these things normally go, I would notice a building that stands out to me, take a picture, and briefly look into its history. As we looked for deals on books and interested bric-a-bracs, nothing really stood out to me this time around. This time, inspiration came in the form of the image below, located in the City of Ottawa archives’ database. 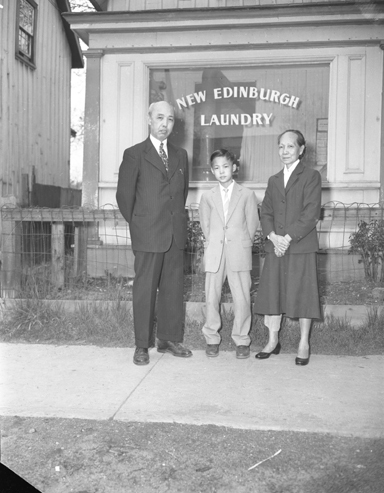 Freeman Leung and family post in front of the family business, the New Edinburgh Laundry, on May 28, 1956. Image: City of Ottawa Archives, CA 038721. For around 50 years (give or take), the small home at 28 Crichton was operated as the New Edinburgh Laundry. The ‘Chinese Laundry’ in Canada has been a well-studied institution and while Ottawa was no different than any other Canadian city in the presence of racially-motivated opposition to their operation, by the time the business was set to close in 1972, it had come to be considered a much-loved local institution by New Edinburgh residents. In 1972, when the Journal’s Gladys Blair profiled the Leung family, the Chinese Laundry had nearly disappeared from the local landscape. Source: Ottawa Journal, January 29, 1972, 31. In the January 29, 1972 edition of the Ottawa Journal, Gladys Blair penned a brief history of the business and the Leung family’s experience in Ottawa. As is the case with so many family businesses, the decision to close shop was less one of declining sales (though that was surely a factor, given how common the washer-dryer set had become in Canadian homes in the years since “Charlie” Leung first opened the business) and more one of succeeding generations not being interested in taking the business over. This is one of the very few such laundries left in Ottawa. As succeeding generations become ‘Canadianized,’ other careers are more appealing, education broader and aspirations higher. The children, grandchildren, and great-grandchildren of “Charlie” not only refuse to be photographed, they don’t want to operate a laundry either.1Gladys Blair, “Lament for a Laundry,” Ottawa Journal, January 29, 1972, 31. 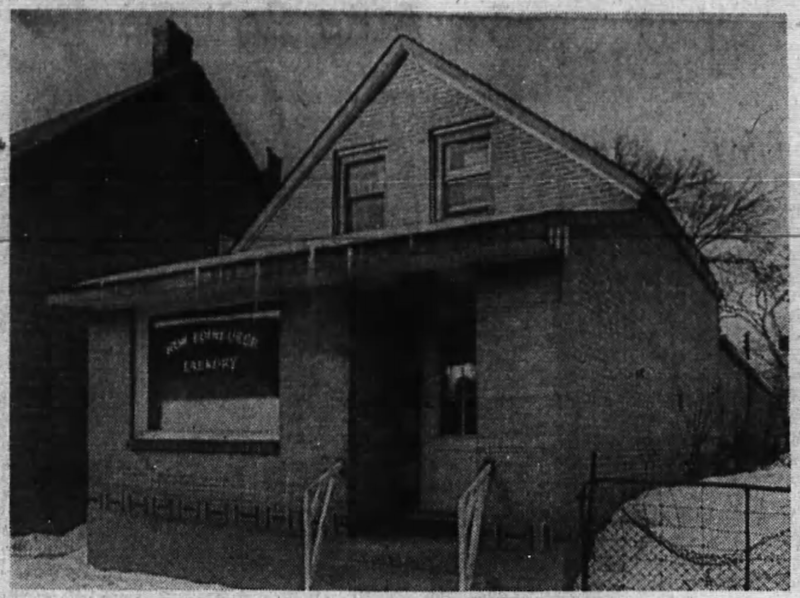 The New Edinburgh Laundry, as captured by the Ottawa Journal in 1972. Image: Ottawa Journal, January 29, 1972, 31. 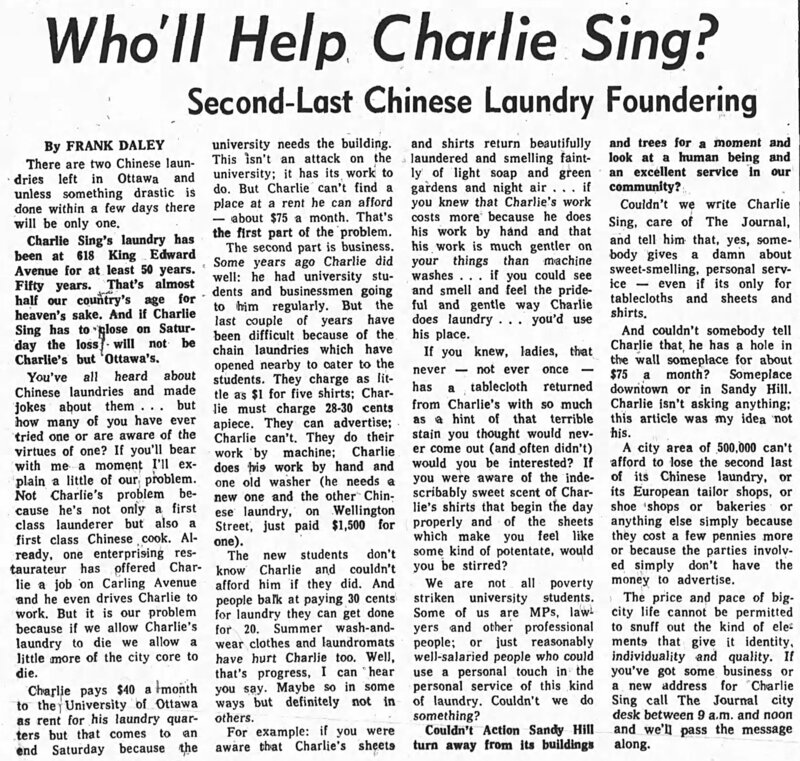 In 1970, there were (reportedly) three Chinese Laundries remaining in Ottawa: the New Edinburgh Laundry, Charlie Sing’s on 618 King Edward, and – what would be the last – on Wellington West in Hintonburg.2Frank Daley, “Who’ll Help Charlie Sing? Second-Last Chinese Laundry Foundering,” Ottawa Journal, January 29, 1970, 3; “Bandits hit laundry for $1,100,” Ottawa Journal, December 3, 1973, 22. In Daley’s lament for Charlie Sing’s laundry at 618 King Edward, he acknowledges the Wellington establishment, but not the New Edinburgh one. Frank Daley of the Journal penned what was a passionate lament for their disappearance, which I have reproduced below. His words are quite telling. Frank Daley waxes poetic about the superior quality of Charlie Sing’s work. Source: Ottawa Journal, January 29, 1970, 3. Some day, I’d like to dig into the issue in a much more comprehensive way that I am here in an admittedly quite brief blog piece. This will likely include some mapping and an adequate discussion about their place in Ottawa’s urban spaces. 1. ↥ Gladys Blair, “Lament for a Laundry,” Ottawa Journal, January 29, 1972, 31. 2. ↥ Frank Daley, “Who’ll Help Charlie Sing? Second-Last Chinese Laundry Foundering,” Ottawa Journal, January 29, 1970, 3; “Bandits hit laundry for $1,100,” Ottawa Journal, December 3, 1973, 22. In Daley’s lament for Charlie Sing’s laundry at 618 King Edward, he acknowledges the Wellington establishment, but not the New Edinburgh one.